How About A Cord And Zephyr To Go With Those International Harvesters? This is Down On The Street Bonus Edition, where we check out interesting street-parked cars located in places other than the Island That Rust Forgot. Today's DOTSBE post is sort of a hybrid deal; UDMan has shot three cool old survivor trucks- including a couple of IHC machines- in New York. Then, as an added bonus, he's talked the owner of a couple of terrifyingly valuable classics into posing said cars for a photo session. Yes, a Cord 812 and a Lincoln Zephyr, and you'll see 'em all if you make the jump. As you may (or may not) know, I'm a factory rep for an Import Truck Distributor, and one of my dealers in the New York region is Jim Reed. He is a minor legend in NASCAR (when they actually drove real Stock Cars, not fake ones). Here is a small biography of Jim when he was racing. Anyway, today was nearly perfect weatherwise, so I convinced Jim to let me take pictures of two of his prized vehicles. I'll start out with a Beige 1941 Lincoln Zephyr V-12 Club Coupe. The 1941 Model used a 292 Cu. In Flathead V-12, linked to a 3 Speed Manual. This car is equipped with a Borg Warner Overdrive, giving the car the ability to cruise over 75 MPH with no problems. Jim owned this car over 4 years, and during that time he has built it up to be a driver, not a trailer queen (as you can see, it is currently registered in New York, and is driven an average of 3,000 miles a year. The car was in rather poor condition when purchased, and was a Dark Brown color. The V-12 has been rebuilt, including a performance camshaft, the Chrome was all re-plated, the O/D was rebuilt, and even though the sheet metal was relatively rust free, it was refinished in it's current light sandstone finish. The interior was refinished two years ago, with a special seat cover made to keep the seats in good condition, since Jim uses it as a real car, and transports his Jack Russell terrier Bocci with him when he comes to work. The work took over 3 years to get into it's current condition, with the engine taking over a year just to get running again. Ok, some details about the photos. Take a look at the floor pedals. There is a high/low beam switch to the left of the clutch, and a Radio Station Changer button right between the Clutch and the Brake pedals. Notice the Art Deco details, including the Bumpers, the Tail Lights, and the Zeppelin shaped turn signals. The "wood" (used on top of the doors, and the dashboard) isn't wood, but hand painted to look like wood. Take a look at the dash, and you will see a hood release, one of the very first offered in any car at the time. On the outside, the hubcaps let you know this was a Lincoln V-12, as does the chrome stip on the hood. Now take a look at the twin carbureted V-12. Isn't that a thing of beauty? I drove this beautiful car short distance, and would love to do it again. 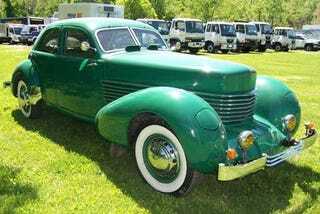 Now, let me introduce you to the 1937 Cord 812. Cord pioneered front wheel drive in production applications with the L-29 in the late 20's. The A-C-D company then created a "Baby" Duesenberg which became in 1936 the Cord 810 with front wheel drive, Lycoming V8 power and a legendary body design from Gordon Buehrig. A year later, in 1937, came modest changes as in this distinctive example of the beautiful Beverly 4-door sedan body style. Finished in green with green cloth interior, the car is used as a driver, and not as a trailer queen. Jim uses this car for about 1,500 to 2,000 miles a year, and he just completed a round trip to an Auburn, Cord, Dusenberg club meet. This car was purchased a couple of years ago through a Hemmings ad. Since Jim took possession, there has been some improvements made, including new wheels and wheel discs, hubs, joints, brakes, tires, and other special features. The Shift controls were thoroughly rebuilt with new servos and micro switches. A bit of history. The 289 Cu In V-8 was made by Lycoming, and it's actually installed backwards, since this car was Front Wheel Drive. The transmission was also unique, as it was the 4-speed manual with helical-cut gears and Bendix "Electric Hand" vacuum-servo pre-selector remote control. The Pre-selector always proved to be problematic, and this car was no exception. Now, some of the photos. Take a look at that aircraft inspired dashboard, with a full set of instrumentation. Notice the two cranks at each side. Those are used to raise and lower the headlamps. This is one of the first cars to use a full wheelcover, instead of hubcaps (notice how these are tied on using zip ties!). The shift lever is the pre-selector. Now take a look at those trunk locks, heavy, and well made. The Art Deco details abound. Under the hood is that Lycoming V-8, and take a look at how the exhaust is routed! In front of the radiator is the Bendix Electric pre-selector shifting mechanism. Notice that the Front Doors are suicide, and the rears are not! 1)The Green one is a 1948 International K-Series 1 ton truck, with a Chrysler Flat head 6 Cyl Engine. This is a truck that is owned by an International Dealer in Plattsburgh, NY. The owner stated that he has two of them, since he was born in 1948. It's all there, but currently not running, as is used as eye candy in front of the dealership. 3) The Maroon/Black Wrecker is a fully functioning 1966 International V200, and it has a Huge Gasoline 549 Cu. In V-8. I can't tell you the horsepower, but it sounds menacing. One thing I did spot when taking pictures was the fact that this still sports split rims, which are somewhat of a hazard if you try and change the tire... ugh!